A man accused of attacking a woman after forcing her into prostitution was acquitted of numerous felonies after the woman’s internet postings revealed a trail of lies and exposed her as a pimp, San Francisco Public Defender Jeff Adachi announced today. Jurors deliberated just over two days before finding 23-year-old Anthony Dorton of San Mateo not guilty Wednesday of assault likely to cause great bodily injury, criminal threats and dissuading a witness, said Dorton’s attorney, Deputy Public Defender Qiana Washington. Jury members hung on pimping and pandering charges. Dorton was arrested Sept. 19, 2011 after a 35-year-old woman told police he pulled her out of his car by her hair, grabbed her cell phone, threw her to the ground and punched her in the head following an argument. The woman had approached Dorton’s girlfriend on the street 11 days earlier, telling her she had been abused and prostituted by another man and was now homeless. Dorton’s girlfriend invited the woman to stay temporarily at the apartment she shared with Dorton and his younger brother. The woman claimed Dorton, a recently laid-off cable installer with no criminal record, also forced her into prostitution. After an unpleasant encounter with a client in San Francisco, the woman said she called Dorton and asked him to pick her up and take her back to his residence to get her things. When Dorton refused, she threatened to call the police and “blow your whole world,” she said. Dorton then picked her up and drove her to a SOMA parking lot, where the attack took place, she claimed. During the two week trial, Washington confronted the woman with images of her Facebook page, in which the woman listed her profession as a self-employed “head pimptress in charge.” She further bragged of earning a graduate degree in the double majors of “Advanced Pimpin” and “keepin hoes in LINE!! !” The woman frequently wrote about supervising and punishing prostitutes in additional Facebook comments, Washington said. On the stand, the woman testified she never worked as a prostitute before arriving in the Bay Area recently and denied pimping other women. During the trial, however, Washington presented several ads on prostitution websites showing the woman’s images and listing her cell phone number. One posting, advertising the services of a 17-year-old prostitute, lists the older woman’s number. On the stand, the woman admitted to taking explicit pictures of the teenager and fielding her calls, but denied she was her pimp. Adachi praised the case’s outcome. 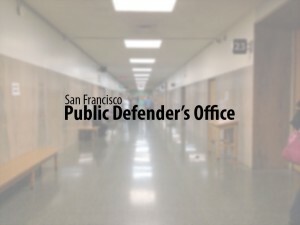 For media inquiries including (but not limited to): scheduling interviews with Public Defender Jeff Adachi, interview with deputy public defenders, staff, questions, and etc., please contact PUBDEF-MediaRelations@sfgov.org.